Students design billboard to help "pay it forward"
This billboard, created by students in the Advertising and Promotion Management class offered through Saunders College of Business, is visible on I-490 in the city of Rochester. RIT student Sarah Johnson has a lot to be thankful for, including her health. And a class offered through Saunders College of Business has allowed Johnson the unique opportunity to “thank” a favorite charity using a billboard high above Rochester. 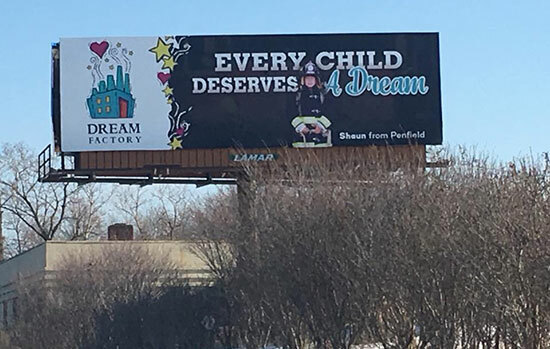 Johnson and her student teammates in the Advertising and Promotion Management course won a class competition to conceptualize and design a billboard for The Dream Factory, a local nonprofit agency that helps dreams come true for children living with critical or chronic illnesses. The billboard was donated by Lamar Advertising and can be seen on I-490 East in downtown Rochester. Two additional billboards were designed by students to promote Lamar Advertising. Those can be seen on I-490 East, near The Strong National Museum of Play, and East Main Street and Richmond Street, not far from Memorial Art Gallery. As a child, Johnson was diagnosed with Type I diabetes, and in 2014, she and her family were treated to a once-in-a-lifetime experience in Hollywood, Calif., funded by The Dream Factory of Rochester. The Dream Factory billboard features 12-year-old Shaun from Penfield, N.Y., who also has Type 1 diabetes and lived his dream of becoming a firefighter and EMT with the Ridge-Culver Fire Department for a day.